It’s hard to imagine life on earth without electricity. In fact, electricity has become so ingrained in our daily lives, that it is pretty much impossible to imagine living without it. Power grid systems, a critical resource for any nation, ensure uninterrupted power supply to keep our homes, workplaces, and gadgets running. One of the major threats to the power grid is, which has been in the news a lot lately, are weather conditions that could not only interrupt our daily lives but destroy the grid. Power grids are susceptible to the devastating effects of hurricanes and heavy downpours. In fact, just recently, we have witnessed three monster storms that pummelled the United States and Puerto Rico, killing more than 100 people, destroying thousands of homes and inflicting economic losses in the hundreds of millions. A plethora of homes lost power due to these extreme weather conditions. All of Puerto Rico was in the dark following Hurricane Maria. Less than half of Florida residents had power after Hurricane Irma. In Texas, Hurricane Harvey took 10,000 MW offline. Unfortunately, the electrical grid infrastructure deployed in the US is showing its age. Combined with the fact that the infrastructure in service today was built during the 1950’s, it wasn’t designed to meet today’s demands or endure the higher temperatures, more intense storms, and larger loads in mind. To mitigate the vulnerabilities of the existing electricity system and guarantee consistent electricity in the future, utilities will have to invest their efforts in developing more resilient and decentralized grids. Making smart decisions will not only play a vital role in improving the flexibility of the electricity system but also reduce the global warming emissions. Today, transmission lines face the biggest risk of hurricane devastation. In fact, history has witnessed the disruption of poles as the major cause of grid disruption. Utility companies are introducing changes in the design standards and replacing the traditional wooden poles with staunch concrete poles. Furthermore, the poles are being incorporated into an aerodynamic design to endure the triple-digit velocity of strong winds. Substations play a major role in the functioning of the electric grid system. In an endeavor to safeguard this flood-prone asset of the grid, the substations are installed with raised platforms that lend stability to the grid. Additionally, in the areas where these measures are difficult to adopt, the operational readiness of the substations is increased by building barriers or walls around the substations. In addition, the grid is safeguarded with the flood monitoring sensors, allowing the de-energization of substations as water rises, avoiding any damage to the equipment. 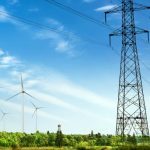 Within this effort, the utilities are putting policies in place to de-energize the grid or some substations as a proactive protective measure. It’s easier to restart the grid than to replace the damaged parts. Maintenance of the grid is another important factor that utilities are continuously working on. It is important to restore the deteriorated lines, poles and other substation and control station equipment regularly. Waiting for the catastrophic weather to hit, then make the replacements, isn’t the right approach. Grid resiliency is the ability to quickly recover from the damage caused by storms. Proper grid resiliency planning provides for a quick damage assessment, rapid crew deployment, and readily available replacement components. A utility’s approach to the grid resiliency is determined more specifically by its distribution system and work environment. For instance, transmission lines feeding substations from power generation center are high voltage cables. Preventing damage to these lines will require changes in the design standards using innovative technology. Utilities plan to be better equipped with the spare concrete poles in the hour of need. De-energizing a substation as a proactive measure helps utilities save its assets. After the initial checks, the substation could be re-energized to restore power to the customers. Here, the restoration time will be much shorter than replacing damaged equipment. An important element of grid resiliency is its survivability. It empowers the grid to maintain some basic level of electrical functionality in the event of a complete loss of electrical service. Installing smart metering could transmit the blackout messages to control center and help the experts analyze the data to chalk out a strategy for early restoration. Additionally, grid resiliency demands for an alternative feeding plan such that if one feeding line to an area is disrupted due to damage, the utility shall restore power from the alternative route. Future Grid: Is it Viable to Go Underground? Whenever a high-intensity hurricane like Sandy strikes and inflicts damage to overhead lines, a familiar question is raised, to put the overhead power lines underground. It seems like the right solution to protect the power lines against any intense storms, whether ice, snow, or wind. Cost disparity is a major drawback to installing underground power lines. Laying down underground cable network incurs substantially higher cost than the overhead lines. Another bottleneck involved with the underground power lines is their deteriorating insulation due to loading cycles. Underground lines are difficult to maintain as detection of a fault is too cumbersome. Overhead lines, on the other hand, have open conductors that are easily accessible for repairs. But, underground cables are difficult to access. This is because repairs would include digging, splicing, re-joining and other activities that need a lot more time and resources than maintaining the overhead cables. Every major weather event leaves behind the trail of destruction costing billions of dollars. Irrespective of the apprehensions, going underground safeguards the grid from the hazards mentioned previously. Different stakeholders need to accept the cost differential of laying underground cables. If underground cables are laid with proper planning, they ensure a long lasting solution to the power blackouts caused by weather. Given the indispensable part electricity plays in society today, it is essential to understand how natural disasters impact the reliability of the electric grid. The risk posed by high-intensity storms is a major concern because of the potential for a widespread and long-term power outage. While the odds of severe storms occurring is moderately low at any given time, one will occur sooner or later. As the electric infrastructure ages, it is important to mitigate the vulnerabilities of the existing electricity system and invest in developing more resilient and decentralized grids.